The North American Free Trade Agreement (NAFTA; Spanish: Tratado de Libre Comercio de América del Norte, TLCAN; French: Accord de libre-échange nord-américain, ALÉNA) is an agreement signed by Canada, Mexico, and the United States, creating a trilateral trade bloc in North America. The agreement came into force on January 1, 1994. It superseded the Canada-United States Free Trade Agreement between the U.S. and Canada. Most economic analyses indicate that NAFTA has been beneficial to the North American economies and the average citizen, but harmed a small minority of workers in industries exposed to trade competition. Economists hold that withdrawing from NAFTA or renegotiating NAFTA in a way that reestablishes trade barriers will adversely affect the U.S. economy and cost jobs. Following diplomatic negotiations dating back to 1990 among the three nations, U.S. President George H. W. Bush, Canadian Prime Minister Brian Mulroney and Mexican President Carlos Salinas signed the agreement in their respective capitals on December 17, 1992. The signed agreement was then ratified by each nation's legislative or parliamentary branch. The earlier Canada-United States Free Trade Agreement had been controversial and divisive in Canada, and the 1988 Canadian election involved discussion on the issue. In that election, more Canadians voted for anti-free trade parties (the Liberals and the New Democrats) but the split caused more seats in parliament to be won by the pro-free trade Progressive Conservatives (PCs). Mulroney and the PCs had a parliamentary majority and were easily able to pass the 1987 Canada-U.S. FTA and NAFTA bills. However, he was replaced as Conservative leader and prime minister by Kim Campbell. Campbell led the PC party into the 1993 election where they were decimated by the Liberal Party under Jean Chrétien, who had campaigned on a promise to renegotiate or abrogate NAFTA; however, Chrétien subsequently negotiated two supplemental agreements with the new U.S. president. In the U.S., Bush, who had worked to "fast track" the signing prior to the end of his term, ran out of time and had to pass the required ratification and signing of the implementation law to incoming president Bill Clinton. Prior to sending it to the United States Senate Clinton added two side agreements, The North American Agreement on Labor Cooperation (NAALC) and the North American Agreement on Environmental Cooperation (NAAEC), to protect workers and the environment, plus allay the concerns of many House members. It also required U.S. partners to adhere to environmental practices and regulations similar to its own. Securing U.S. congressional approval for NAFTA would have been impossible without addressing public concerns about NAFTA's environmental impact. 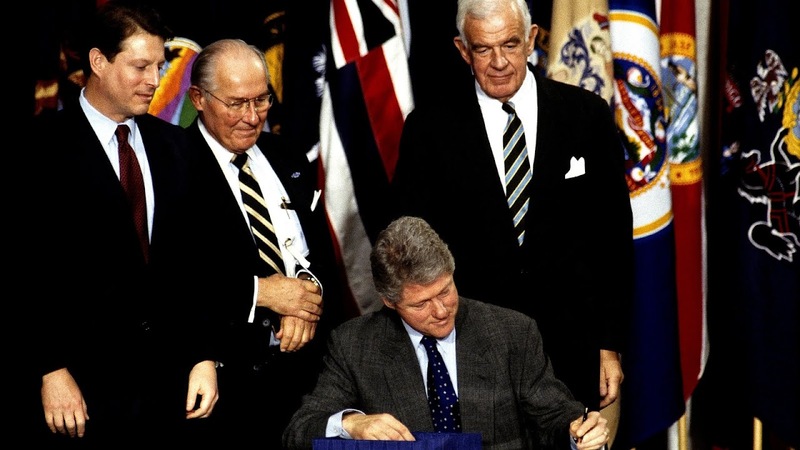 The Clinton administration negotiated a side agreement on the environment with Canada and Mexico, the North American Agreement on Environmental Cooperation (NAAEC), which led to the creation of the Commission for Environmental Cooperation (CEC) in 1994. To alleviate concerns that NAFTA, the first regional trade agreement between a developing country and two developed countries, would have negative environmental impacts, the CEC was given a mandate to conduct ongoing ex post environmental assessment of NAFTA. In response to this mandate, the CEC created a framework for conducting environmental analysis of NAFTA, one of the first ex post frameworks for the environmental assessment of trade liberalization. The framework was designed to produce a focused and systematic body of evidence with respect to the initial hypotheses about NAFTA and the environment, such as the concern that NAFTA would create a "race to the bottom" in environmental regulation among the three countries, or the hope that NAFTA would pressure governments to increase their environmental protection mechanisms. The CEC has held four symposia using this framework to evaluate the environmental impacts of NAFTA and has commissioned 47 papers on this subject. In keeping with the CEC's overall strategy of transparency and public involvement, the CEC commissioned these papers from leading independent experts. From the earliest negotiation, agriculture was (and still remains) a controversial topic within NAFTA, as it has been with almost all free trade agreements that have been signed within the WTO framework. Agriculture is the only section that was not negotiated trilaterally; instead, three separate agreements were signed between each pair of parties. The Canada-U.S. agreement contains significant restrictions and tariff quotas on agricultural products (mainly sugar, dairy, and poultry products), whereas the Mexico-U.S. pact allows for a wider liberalization within a framework of phase-out periods (it was the first North-South FTA on agriculture to be signed). Like Mexico and the U.S., Canada received a modest positive economic benefit as measured by GDP. Many feared declines failed to materialize, and some industries, like the furniture industry, which were expected to suffer, grew instead. Canadian manufacturing employment held steady despite an international downward trend in developed countries. One of NAFTA's biggest economic effects on U.S.-Canada trade has been to boost bilateral agricultural flows. In the year 2008 alone, Canada exports to the United States and Mexico were at $381.3 billion, and imports from NAFTA were at $245.1 billion. The overall effect of the Mexico-U.S. agricultural agreement is a matter of dispute. Mexico did not invest in the infrastructure necessary for competition, such as efficient rail roads and highways, which resulted in more difficult living conditions for the country's poor. Mexico's agricultural exports increased 9.4 percent annually between 1994 and 2001, while imports increased by only 6.9 percent a year during the same period. Production of corn in Mexico has increased since NAFTA's implementation. However, internal corn demand has increased beyond Mexico's sufficiency, and imports have become necessary, far beyond the quotas Mexico had originally negotiated. Zahniser & Coyle have also pointed out that corn prices in Mexico, adjusted for international prices, have drastically decreased, yet through a program of subsidies expanded by former president Vicente Fox, production has remained stable since 2000. Reduction in agricultural subsidies in the developed world, especially corn subsidies, has been suggested as a way to reduce harms to Mexican farmers. A 2001 Journal of Economic Perspectives review of the existing literature found that NAFTA was a net benefit to Mexico. By the year 2003, 80% of the commerce in Mexico was executed only with the U.S. The commercial sales surplus under NAFTA with the U.S., combined with the deficit on the rest of the world, created a dependency in Mexico's exports. These effects were evident in 2001-2003; the result of that recession was either a low rate or a negative rate in Mexico's exports. The growth from new orders of products indicates that there was an increase in the demand from manufacture products. This increased demand resulted in an expansion of the production and a higher employment rate to satisfy the increment in the demand. The growth in the maquiladora industry and in the manufactory industry has been of 4.7% by August, 2016. Three quarters of the outer market of importation and exportations comes from the U.S.
Economists consider NAFTA to have been beneficial for the United States. In a 2012 survey of leading economists, 95% supported the notion that on average, U.S. citizens benefited on NAFTA. A 2001 Journal of Economic Perspectives review found that NAFTA was a net benefit to the United States. A 2015 study found that US welfare increased by 0.08% as a result of the NAFTA tariff reductions, and that US intra-bloc trade increased by 41%. In 2015, the Congressional Research Service concluded that the "net overall effect of NAFTA on the U.S. economy appears to have been relatively modest, primarily because trade with Canada and Mexico accounts for a small percentage of U.S. GDP. However, there were worker and firm adjustment costs as the three countries adjusted to more open trade and investment among their economies." The report also estimated NAFTA added $80 billion to the US economy in the years since NAFTA's implementation, equivalent to a 0.5% increase in US GDP. University of California, San Diego, economics professor Gordon Hanson has said that NAFTA helped the U.S. compete against China and therefore saved U.S. jobs. While some jobs were lost to Mexico as a result of NAFTA, considerably more would have been lost to China if not for NAFTA. In a study published in the August 2008 issue of the American Journal of Agricultural Economics, NAFTA has increased U.S. agricultural exports to Mexico and Canada even though most of this increase occurred a decade after its ratification. The study focused on the effects that gradual "phase-in" periods in regional trade agreements, including NAFTA, have on trade flows. Most of the increase in members' agricultural trade, which was only recently brought under the purview of the World Trade Organization, was due to very high trade barriers before NAFTA or other regional trade agreements. For impacts specific to the United States, see NAFTA's effect on United States employment. According to the Economic Policy Institute, California, Texas, Michigan and other states with high concentrations of manufacturing jobs were most affected by job loss due to NAFTA. EPI economist Robert Scott estimates some 682,900 U.S. jobs have been "lost or displaced" as a result of the trade agreement. However, other studies have found that NAFTA only had a modest impact on manufacturing employment, and that automation explains away 87% of the losses in manufacturing jobs. According to University of California, Berkeley professor of economics Brad DeLong, NAFTA had an insignificant impact on US manufacturing. The adverse impact on manufacturing has been way exaggerated in US political discourse according to DeLong, which is something that Harvard economist Dani Rodrik agrees with. Canadian authorities estimated that, as of December 1, 2006, a total of 24,830 U.S. citizens and 15,219 Mexican citizens were present in Canada as "foreign workers". These numbers include both entrants under the NAFTA agreement and those who have entered under other provisions of the Canadian immigration law. New entries of foreign workers in 2006 were 16,841 (U.S. citizens) and 13,933 (Mexicans). Nevertheless, the institutional frameworks of the cross-border migrations are weak, so as the institutional roles and responsibilities at both in the national and international levels. We have got to stop sending jobs overseas. It's pretty simple: If you're paying $12, $13, $14 an hour for factory workers and you can move your factory south of the border, pay a dollar an hour for labor,...have no health care--that's the most expensive single element in making a car-- have no environmental controls, no pollution controls and no retirement, and you don't care about anything but making money, there will be a giant sucking sound going south. The preparations for NAFTA included cancellation of Article 27 of Mexico's constitution, the cornerstone of Emiliano Zapata's revolution of 1910-1919. Under the historic Article 27, Indian communal landholdings were protected from sale or privatization. However, this barrier to investment was incompatible with NAFTA. With the removal of Article 27, Indian farmers feared the loss of their remaining lands, and also feared cheap imports (substitutes) from the US. Thus, the Zapatistas labelled NAFTA as a "death sentence" to Indian communities all over Mexico. Then EZLN declared war on the Mexican state on January 1, 1994, the day NAFTA came into force. Lone Pine Resources Inc. v. Government of Canada has filed a US$250 million claim against Canada, whom it accuses of "arbitrary, capricious and illegal" behaviour, because Quebec aims to prevent fracking exploration under the St. Lawrence Seaway. Milos Barutciski, the lawyer who represents Lone Pine, has decried attempts to portray his client as "another rapacious multinational challenging governments' ability to regulate for health, safety and the environment". Lone Pine Resources is incorporated in Delaware but headquartered in Calgary, and had an initial public offering of stock on the NYSE on May 25, 2011, which offered 15 million shares each for $13 and raised US$195 million. Barutciski acknowledged "that NAFTA and other investor-protection treaties create an anomaly in that Canadian companies that have also seen their permits rescinded by the very same Quebec legislation, which expressly forbids the paying of compensation, do not have the right pursue a NAFTA claim," and that winning "compensation in Canadian courts for domestic companies in this case would be more difficult since the Constitution puts property rights in provincial hands." A treaty with China would extend similar rights to Chinese investors, including SOEs. In a 60 Minutes interview in September 2015, the American businessman Donald Trump, having announced his candidacy for the 2016 presidential election just three months earlier, condemned the North American Free Trade Agreement (NAFTA), calling it "the single worst trade deal ever approved in [the United States]", going on to say that if elected president, "We will either renegotiate it, or we will break it." Juan Pablo Castañón, president of the Consejo Coordinador Empresarial, expressed his concerns about the renegotiation and the willingness to focus on the car industry that has brought a lot of success A range of trade experts have said that pulling out of NAFTA as Trump proposed would have a range of unintended consequences for the U.S., including reduced access to the U.S.'s biggest export markets, a reduction in economic growth, and increased prices for gasoline, cars, fruits, and vegetables. Members of the private initiative in Mexico said that in order to eliminate NAFTA there are a lot of laws that have to be adapted by the U.S. Congress and this will also eventually result in legal complaints by the World Trade Organization. The Washington Post fact-checker furthermore noted that a Congressional Research Service review of the academic literature on NAFTA concluded that the "net overall effect of NAFTA on the U.S. economy appears to have been relatively modest, primarily because trade with Canada and Mexico accounts for a small percentage of U.S. GDP." Shortly after being elected, U.S. President Donald Trump announced his intention to begin renegotiating the terms of NAFTA, seeking to resolve issues with trade outlined during his campaign for the presidency. The leaders of Canada and Mexico have indicated their willingness to work with the Trump administration, and although vague on the exact terms that he will be seeking in a renegotiated NAFTA, Trump has threatened to withdraw from it if negotiations fail. In July 2017, the Trump administration provided a detailed list of changes that it would like to see to NAFTA. The top priority for the administration is the reduction in the United States' trade deficit. The administration also called for the elimination of provisions that allowed Canada and Mexico to appeal duties imposed by the United States and limited the ability of the United States to impose import restrictions on Canada and Mexico. The list also voiced concerns about subsidized state-owned enterprises and currency manipulation. According to Chad Bown of the Peterson Institute for International Economics, the Trump administration's list "is very consistent with the president's stance on liking trade barriers, liking protectionism. This makes NAFTA in many respects less of a free-trade agreement." The concerns over subsidized state-owned enterprises and currency manipulation are not deemed applicable to Canada and Mexico. Jeffrey Schott of the Peterson Institute for International Economics noted that it would not be possible to conclude renegotiations quickly while also addressing all the concerns on the list. He also said that it would be difficult to do anything about trade deficits. According to Tufts University political scientist Daniel W. Drezner, the Trump administration's desire to return relations with Mexico to the pre-NAFTA era are misguided. Drezner argues that NAFTA made it easier for Mexico to transform to a real democracy and become a country that views itself as North American. If Trump acts on many of the threats that he has made against Mexico, it is not inconceivable that Mexicans would turn to left-wing populist strongmen, as several South-American countries have. At the very least, US-Mexico relations would worsen, with adverse implications for cooperation on border security, counterterrorism, drug-war cooperation, deportations and managing Central American migration. According to Chad P. Bown (senior fellow at the Peterson Institute for International Economics), "a renegotiated NAFTA that would reestablish trade barriers is unlikely to help workers who lost their jobs -- regardless of the cause -- take advantage of new employment opportunities." According to Harvard economist Marc Melitz, "recent research estimates that the repeal of NAFTA would not increase car production in the United States." Melitz notes that this would cost manufacturing jobs. If the Trans-Pacific Partnership comes into effect, existing agreements like NAFTA will be reduced to those provisions that do not conflict with the TPP, or that require greater trade liberalization than the TPP. However, only Canada and Mexico will have the prospect of becoming members of the TPP after U.S. President Donald Trump withdrew the United States from the agreement in January 2017. In May 2017, the 11 remaining members of the TPP, including Canada and Mexico, agreed to proceed with the trade deal without U.S. participation.